“In July 2016, I published a story called ‘#betiuthao‘, Operation Babylift for Outlook magazine on how three RSS affiliated outfits trafficked 31 tribal girls from Assam to Punjab and Gujarat on the pretext of providing them free education violating Juvenile Justice Act, Supreme Court order 2010 and United Nations Convention on Child rights among other laws. Almost two years since the story, 19 of those girls are being repatriated back to Assam to reunite them with their families. 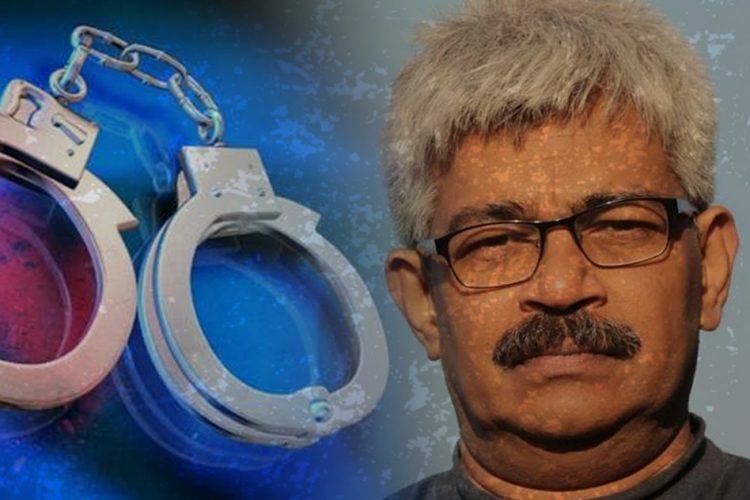 Thanks to activists like Digambar Narzary. All the trolling, court cases and abuse post the publication of the story was worth it,” wrote journalist Neha Dixit. In the border areas of Assam, there’s a comprehensive network of Sangh outfits which concentrate on welfare activities that are used to zero in on needy families. On June 9, 2015, 31 tribal girls—aged 3-11 years—were made to board a train by two women (Korobi Basumatary and Sandhyaben Tikde) of two Sangh Parivar outfits, the Rashtra Sevika Samiti and Sewa Bharati, on the promise of education in Punjab and Gujarat. The girls were from five border districts of Assam, Kokrajhar, Goalpara, Dhubri, Chirang and Bongaigaon. In almost three years, the girl’s parents hadn’t been able to contact them. For each and every girl that Neha Dixit wrote about, she first got documents from her source, then approached different child welfare committees and government bodies to confirm. 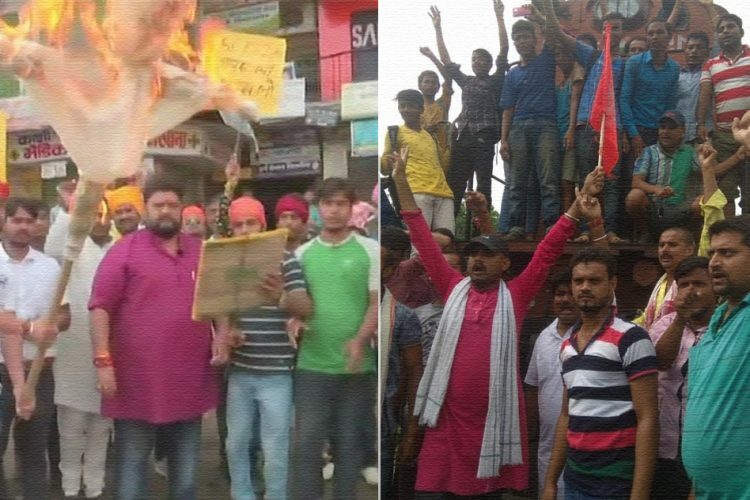 The third check was the parents who said the same thing and the fourth point of corroboration were the girls themselves in Punjab and Gujarat. 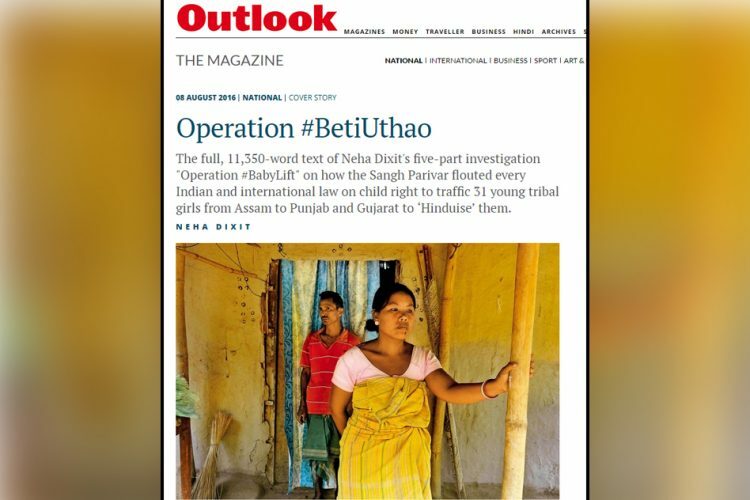 #BetiUthao took Dixit 4 months of research – 3 months of reporting and 1 month of field reporting. On June 16, 2015, a week after the girls were taken away, the Assam State Commission for the Protection of Child Rights (ASCPCR) wrote a letter to the ADGP, CID, Assam police, and marked it to the National Commission for Protection of Child Rights, calling this incident “against the provision of Juvenile Justice Act 2000” and concluded that it amounts to “child trafficking”. 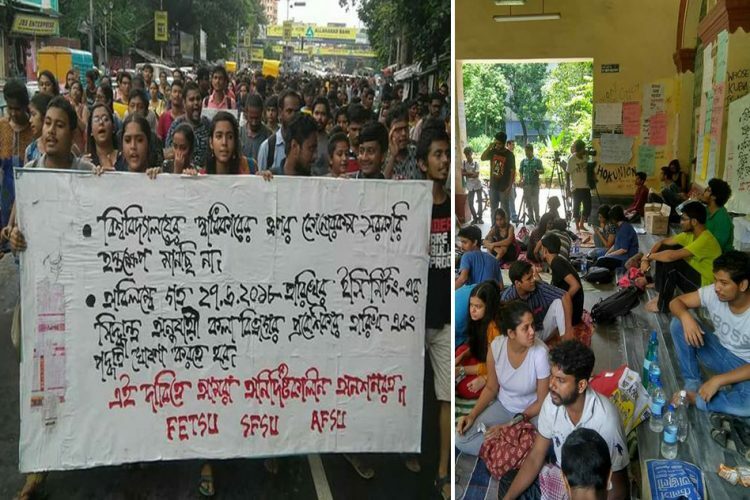 The commission req­uested the police “to initiate a proper inquiry into the matter and take all necessary steps to bring back all 31 children to Assam for their restoration”. 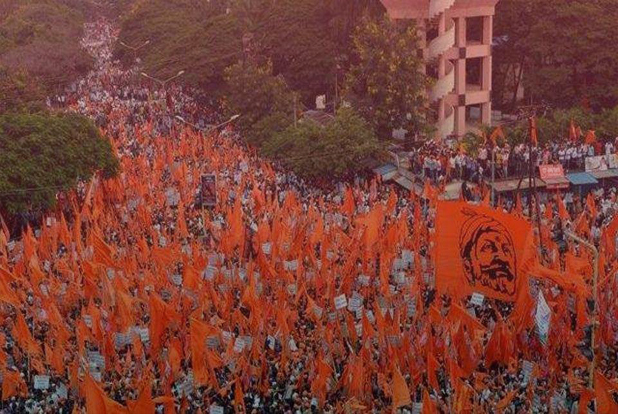 The police was asked to submit an Action Taken Report to the ASCPCR within five days of receipt of the letter. No act­ion was taken; no report was filed; no cognisance was taken by the National Commission for Prote­ction of Child Rights, which is monitored by the BJP-ruled centre, said Dixit. After the ASCPCR letter to the police and other government bodies, members of the Child Welfare Committee (CWC) of Kokrajhar made several visits to the houses of the trafficked girls. CWCs have powers akin to that of a metropolitan magistrate or a first class judicial magistrate. It can hold people accountable for a child, transfer the case to a different CWC closer to the child’s home, reunite a child with his/her community. Besides violating the Supreme Court guideline of 2010 to not take any child outside Assam and Manipur for any purpose including studies, Sewa Bharati, Vidya Bharati and Rashtra Sevika Samiti also violated the Juvenile Justice Act by not producing the girls bef­ore CWCs in Assam or obtaining NOCs from them before taking them away to Gujarat and Punjab. -I am a cultivator and a riot victim. -My home is totally damage(d) in the riot which occurred on 25th January 2014. -I still stay in relief camp. -I don’t have source of income. -I could not afford the school fees for my daughter. -So, for better education I am sending my daughter to Gujarat to study in (by) my own will. Outlook has copies of the affidavits—all in English, signed in English, and identical. Most of the parents Outlook met are eit­her illiterate or don’t know English. Not only was this illegal, since the affidavits should have been made bef­ore the children were being taken away, not a month later, none of these parents were affected in the ‘riots of 2014’ or lived in relief. They had some sources of incomes, found CWC probation officer, and the riots the affidavit mentioned took place in December 2014, not January 2014. Taking the children away was in violation of the UN Convention on the Rights of the Child, of which India is a party. According to the Convention, no child can be separated from parents unless they are neglected or abused. On June 11, Childline Delhi got a call from an informer about the trafficking of these girls on the Poorvottar Sampark Kranti Exp­ress. The girls were rescued at Paharganj station in New Delhi. 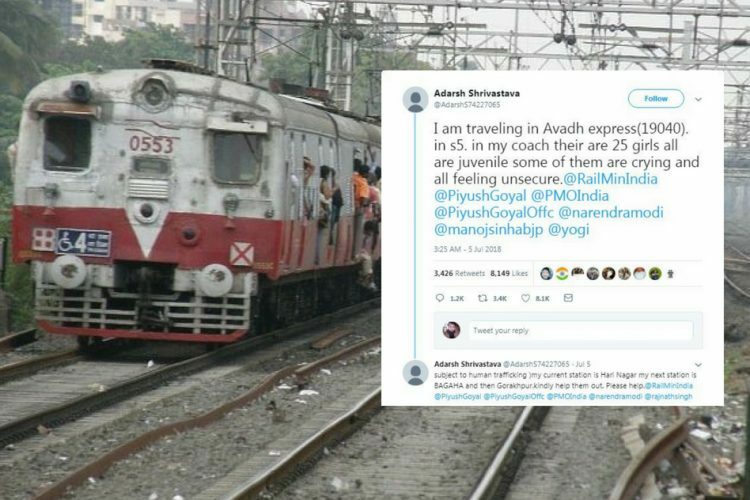 The same day, Shaiju, a coordinator of Childline, wrote to Sushma Vij, chairperson of the Child Welfare Committee in Mayur Vihar, Delhi, informing her that the children, who were accompanied by “a lady called Sandhya from Kokrajhar and Bongaigaon in Assam”, were rescued and taken to the police station for cross-checking their documents. But at this juncture, strangely, an order of the CWC, Surendranagar, intervened and within a day, the girls were sent onward to their destinations from the police station its­elf. A letter dated June 16, 2015 from Runumi Gogoi, chairperson of the ASCPCR, to the ADGP, CID, Assam Police, says: “The Childline India Foundation, Central Zone, with the help of informer and anti-human trafficking unit, Crime Branch, GP, and RPF rescued children on June 11, 2015, at about 7.40 pm at New Delhi Railway Station.” It dir­ected the Assam police “to initiate a proper enquiry into the matter and take all necessary steps to bring back all 31 children to Assam. 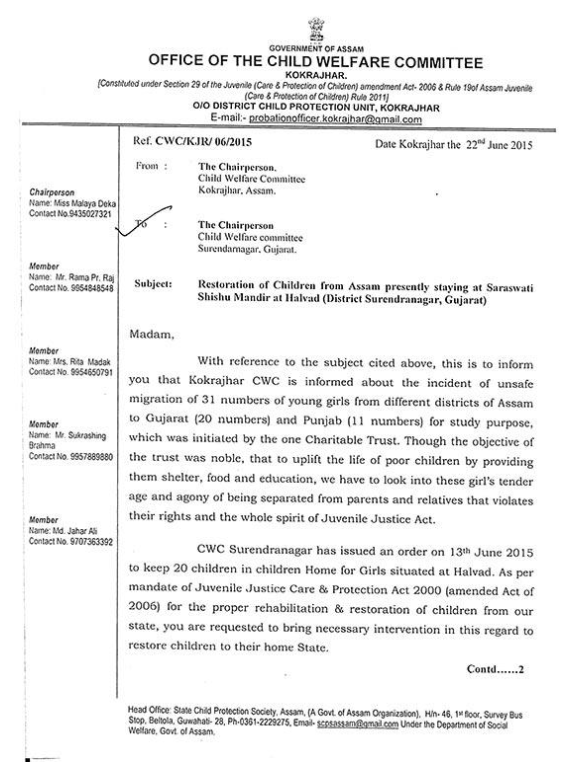 A day later, on June 18, Kumud Kalita, IAS, member-secretary, State Child Protection Society, Assam, wrote to the CWCs in Kokrajhar and Bassaigaon, asking them to bring back the children at the earliest. In July 2016, the Outlook magazine published Neha Dixit’s detailed report. “I was informed on March 3, 2017 that 6 girls have come back out the 31, which shows the lack of responsibility of the government toward the rights of tribal girls in the state of Assam,” Neha Dixit had told in an interview to The Logical Indian. On April 12, 2018, the Child Welfare Committee, Morbi district, issued a notice to Assam Child protection society that they are sending 19 girls back via train on April 22, 2018 to Assam and Meghalaya to their parents. “As reporters, we know that a certain topic might attract some kind of attention from particular sections of the society; you have to be careful enough to corroborate every single detail,” Dixit had told The Logical Indian. While she was at work in Assam, members of the RSS tried to threaten her. When she went to meet the girls in Gujarat, they locked her inside the Saraswati Shishu Mandir – where the girls were. “After #BetiUthao was published, some people tweeted my residential address and found out the address of my family members too,” said Dixit. However, after the girls were united with their parents, Neha Dixit believes that all trolls, abuses and court cases were worth it.